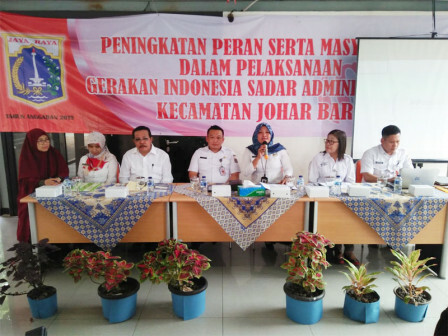 Johar Baru Sub-district, Central Jakarta holds population administration service and socialization at Pandawa Children-Friendly Integrated Public Space (RPTRA), Tanah Tinggi Urban Village, on Thursday (4/11).
" We serve residents who want to make birth certification and children identity card (KIA) through door-to-door service"
This socialization is done to support Gerakan Indonesia Sadar Adminduk (GISA) program from Home Affairs Ministry to inform Jakartans about the importance of population administration. "We serve residents who want to provide birth certification and children identity card (KIA) through door-to-door service," she mentioned, Thursday (4/11). In this service, residents can also consult and complaint about population administrative documents such as misspelling name and procedures to apply for administrative documents. "From 8-11 AM, we have issued 76 KIAs for children at age 0-4, 176 KIAs for children at age 5-16, 8 birth certificates, and received 30 complaints," he stated.